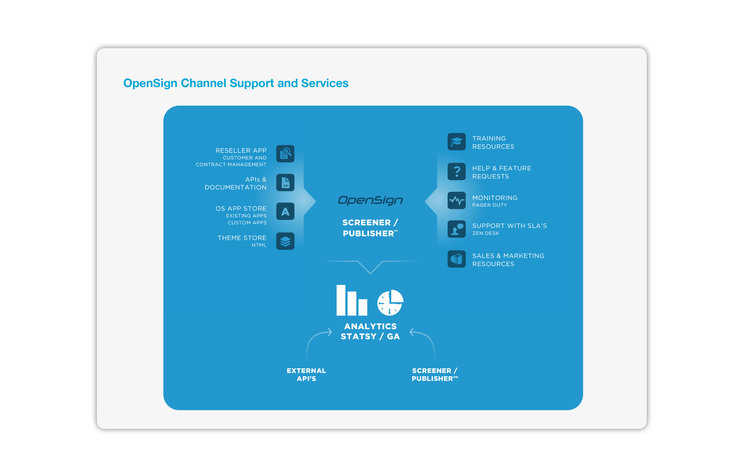 OpenSign allows agencies and marketing people to deliver and measure exciting new customer experiences to screens in-store using their existing web tools and technology without having to understand how to deploy and manage the network and hardware. Web and mobile content can be used or repurposed in store where 94¢ in the dollar are still spent, and measured in real time along with their other marketing activities with Google Analytics or other 'big data' tools. It also makes it easy to plug-in other customer movement and hardware such as iBeacon. Screener also reflects a new revenue opportunity for agencies in new services revenues as well as ongoing annuity through ongoing licensing. Help desk ticketing. You can call, chat online or use this email address. All generate a ticket to track and report on response and issues. Why Web CMS? All Signage CMS’s are proprietary which is against the flow of business and software globally. The web CMS industry is a multi billion dollar industry that’s fast moving and driven by the Marketing team. [80% of all IT spend with be managed by the CMO by 2016 *Intel]. The customer journey starts and ends here. Web CMS’s can personalise, customise, regionalise, and report on the entire customer journey. For larger companies they tend to have an agency or develop web/e-commerce content in-house. We currently have Web CMS Publisher and Magento fully integrated but any web CMS can be used such as WordPress, Sitecore, Drupal, Adobe AEM or the 1,000’s of others ranging from enterprise to very simple creation and editing. If the CMS is not integrated you simply edit the content in the CMS and manage the Screens in OpenSign. The OpenSign Ecosystem works with standard web technologies and a Firefox or Crome Browser so anyone that can develop websites particularly for mobile [as they are touch and require HTML5] can for OpenSign.